I logged in the other day and was pleased to find Pelly waiting for me, wanting to start off a new gardening initiative for Valentine’s Day. I think this is especially cute b/c 1) the Pelly/Pete/Phyllis love triangle was not really acknowledged in AC:NL and 2) Valentine’s Day is usually kind of down-played in the AC series. It’s one of those holidays where you’d just get a letter from mom and maybe a present from your bestie. But in AC:PC we are definitely celebrating Valentine’s Day, and most specifically: SWEETS. Yummy tarts are prizes for completing gardening objectives. New fortune cookies with a chocolatier theme, called “Poppy’s cocoa cookie,” have been released as well. 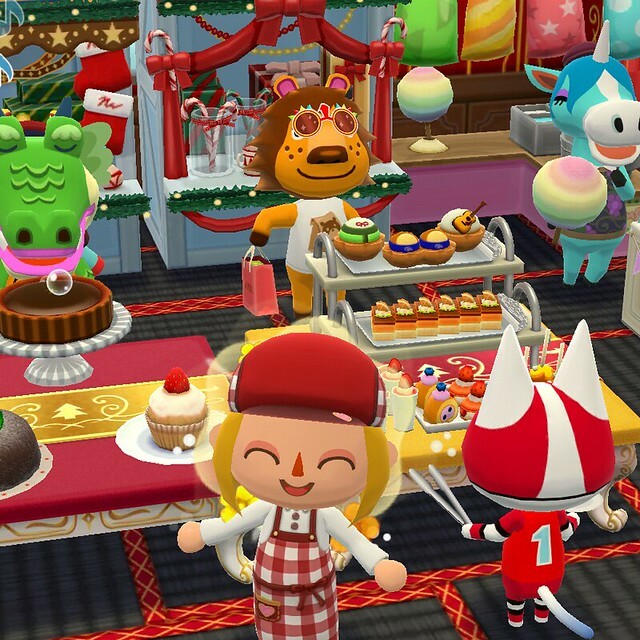 Mayor Gluxie updated her ‘party cabin’ to have a sweet dessert theme! Superstar Sweets are the themed collectible item for this event. More sweets are planned for the coming weeks, and we will even be able to select a Sweetest Friend to give a special gift to on Valentine’s Day! And that’s not the only sweet new discovery. New fruit trees have been rolled out as ‘local’ produce. You can place them in your market box to entice your friends to ‘trade’ by making purchases and posting their own regional fruit. It can be either lychees, grapes or lemons! Mayor Gluxie got lychees! There have also been some interesting UI improvements with this latest update. Pete now shows up in the Map menu, offering to direct deliver items to fulfill the requests of the animals on the various islands. No more island hopping just to complete those simple requests! It saves a lot of time and ensures that I actually help my animal friends a bit more. Everybody wins! Of course, I still end up traveling to all of the islands, since I’m now using up more resources thanks to Pete’s delivery service. It makes for more efficient gaming and I like it! While Pete’s Item Deliveries are a huge add, that wasn’t the only major feature brought on in this latest update. Blathers has also returned to the game, bringing an Explore Maps mini game that can unlock riches, resources and even new animal friends if you’re lucky! You can collect treasure maps by completing requests and shooting down balloons. How fun! Some of the treasure maps are very EXPENSIVE though (try 30,000 bells per roll of the dice! Yikes!) but the prize at the end is usually worth it. What do you think of the latest features in AC:PC? Are you still playing? ARE WE FRIENDS?? Let’s trade heartbeatles! !